Communication Preparedness is the 10th Principle of Preparedness. I realize that I haven’t addressed this topic as extensively as I have the nine other principles, but the truth is, it’s not my forte. Mind you I’m cognitive of needing secret ways to communicate, special words of phrases for everyday safety, and I teach my husband Tagalog, and we’re trying to master the use of Morse Code, but I couldn’t even begin to use his shortwave radio if my life relied on it. In fact, I didn’t even know what a shortwave radio was until I read James Wesley Rawles book, “Survivors” where a character uses it in order to get home from one side of the world to the other. I also feel very intimidated with the HAM radio licensing requirements so I’ve left that up to the hubby. Yup. I’m going to say it, it’s a BIG BAD vulnerability that I’ve left myself exposed to with having to rely on someone else for that type of communication, but I AM working on it. Fortunately, there are lots of other folks out there who are willing to use their expertise to benefit others, and even write a comprehensive book on the matter to that will be helpful to even the newest of the newbies. Today, I’d like to tell you about such a resource. 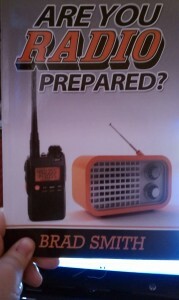 Brad Smith is the author of “Are You Radio Prepared?” And he kindly sent me a copy of his book to review. The funny thing is with the holidays and me launching this 100 Days of Prepping, I felt a bit overwhelmed just getting my normal research reading done. But for the past 2 weeks I’ve been inundated with questions from readers and I’d say that about 15% of those messages are coming from folks who are wet behind the ears but wanting to make sure that they have the ability to communicate in a power-down emergency. Well, I have to say that I’d recommend Brad’s book for just about anyone who wants to venture into that aspect of preparedness. Brad covers many of the key basics of getting ready to communicate in a society-down scenario as well as enjoying HAM and shortwave radio communications as a hobby. He tells you what you need to know before purchasing the equipment and provides you with equipment resources. He manages to do so without making you feel like an imbecile--nicely done, Brad--and this coming from a gal who's too freaked out to try and take the HAM radio class. *grin* (O.k. O.K. before I get an litany of messages from you guys about this, suffice it to say that I only have so much hard drive space on my brain right now, and the thought of adding such technical instructions right now is just more than I want to bite off. Thank You.) The only thing that Brad doesn’t cover in his book is protecting the equipment in the event of a coronal mass injection or an electric magnetic pulse event which would fry much of your equipment. So I’ll simply address it here briefly. Yes, you would need to keep your communications equipment stored in an appropriate faraday cage environment. A microwave is not suitable as a faraday cage because it would only protect against a specific wavelength. The power brought by an EMP would be too much power for a microwave and too many frequencies. Any gaps in a faraday cage must be significantly smaller than the wavelengths which you’re trying to protect against. I’ll write a more detailed article in this 100 Days of Prepping series specifically on faraday cages and specifically on EMPs so you’ll need to be patient on that aspect, but in the meantime, you can take advantage of Brad Smith’s book and get yourself squared away in this aspect of preparedness. I believe that there are a myriad of reasons why this kind of preparedness is necessary for us to have on hand. With the threats of our own government shutting down the internet, with the realization that very few homes actually have a land-line anymore and most of the nation’s population relying on the use of cell phones, there’s every reason to believe that a crisis would cripple us and our ability to communicate. In my opinion, communication is vital to a person’s security and safety. Until tomorrow…. Do Preppers Belong on TV? Sometimes things just blow my mind! Kellene, I didn't know you and Brad knew each other...Brad and I are members of the same Search and Rescue Team...what a small world! Brad, we need to TALK! I actually only "know" Brad through e-mail. But it's nice to see such a nice small world when access to quality people comes into play, isn't it? Kevin, GMRS is General Mobile Radio Service. It is a UHF radio service that shares frequencies with FRS (Family Radio Service). GMRS is part of the Citizens Radio Services with FRS, MURS and CB. A license is required. The fee is $85 for 5 years. You do NOT have to take a test and the license covers you, your family and in-laws. You can legally run 4 or 5 watts handheld and 50 watts at a base station. Repeaters (relay stations) are legal on GMRS and greatly extend the range of handhelds. Contact me if you need more info. brad73 (at) radioprepared (dot com). gmrs myself. most may not but thats just me. Everyone has a different opinion on this topic. I've been a ham for over thirty years, it is a fun hobby as well as useful in a emergency. Since they dropped the code requirement it is easier to get licensed. Kellene, thanks for reviewing my book! I am like Mr. Prepper, I will be using GMRS for my family. Some other hams in Tulsa and I are setting up a GMRS repeater sometime this year. If anyone has questions, please email me! Suzie Q my hubby and I think this is an excellent idea and we still have our home bases, mics, and several CBs ready to do into our vehicles. We have told our children to do the same. BUT we also are studying for our Ham Radio Licenses as well because we can be of benefit for those who are trying to reach loved ones long distances away to let them know that they are ok, etc. 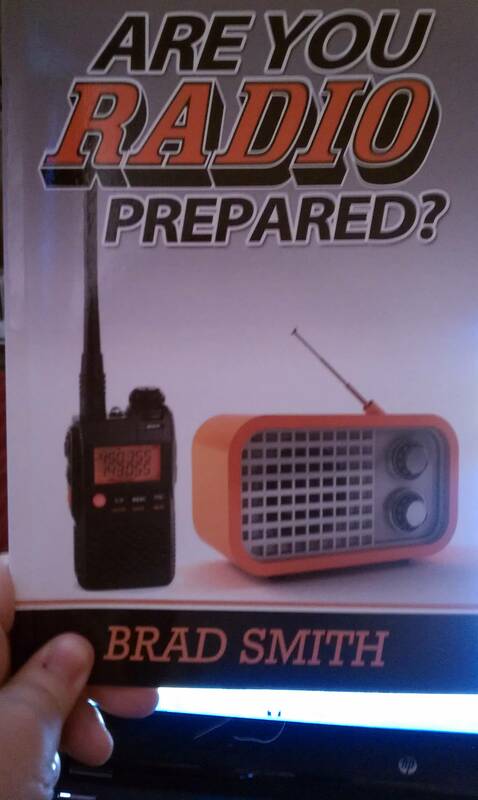 Brad Smith is the author of “Are You Radio Prepared? at Amazon.com and you may sample read it at Amazon Prime free. THEN, when I like a book there, it goes into my preparedness library. No point in having an e=book that is only available to one person, and then only if the computer is on. My idea is that it's a good thing to have a hard copy of those books that are worthwhile already in the book case at home. Maybe more than one copy, actually... your bug out location, or bag could use certain information in print. Just a note, I print my e-Books so that I have a hard copy in my preparedness library. I also print any articles, information, etc. that I believe could be useful sometime in the future. Most of it is from the Preparedness Pro :). Getting a HAM license is easy! The actual questions for the test are published on the internet. All you have to do is memorize the answers to the questions. There are practice tests on the internet you can take until you are ready to take the actual test. If you take the practice tests over and over until you can get an 80 percent on them, you will be ready to take the real test. I have taught over 100 people what it takes to get a license. The youngest student was a 7 year old girl! Do you have a good link for the practice questions? Hi Kellene- A few years ago I had to get my HAM license as part of my job (for Homeland Security of all things!). It was a blessing in disguise as it opened up a whole new world of survival skills. My husband followed suit and has his license now. We are both General licensees, and I had to get mine with Morse Code also. Look into the GMRS realm...I have a friend who has organized most of the neighborhoods in Seattle with repeaters and test schedules. It is quite an impressive setup and will put the power to the people when you know what hits the fan. You have my contact info...touch base if you want more info. Its a very solid solution! We all have our strengths and our weaknesses. You are super prepared with personal safety and food stuffs. I have my amateur radio license and radios. I only have the first level but that is enough to get on air and talk to the space station if I want... Technician level is pretty easy with very little technical stuff and little math. The other levels I don't promise they are that easy. Communication has pushed me into guns and concealed weapons... pushed me into more active emergency prep ... etc. With all you do this is so easy you should have a technicians lic. let your hubby have the rest. Mine does... then you at least know the protocol for the radio when/if you do have an need to operate it. In my test sessions were middle schoolers (all 3 did pass) to very senior individuals and both male and females. Print out the questions (and answers) cut them up and put them on 5x8 index cards and write (or tape) the correct answer on the back - don't memorize "a" or "b" - memorize the words - the test questions are EXACTLY the same as what you'll study - the answers are mixed up but the verbage/words are exactly the same. "At first, the weak perish. Then, the rest fight." This way if the SHTF you can talk to your prepper buddies that don't have HAM radios but do have FRS/GMRS radios. WARNING - You may not use you HAM radio to talk on any band you aren't licensed to use nor may you use more power than is legal for a specific band. These comments and suggestions for the MARS/CAP Mod are for SHTF times ONLY - just because you can do something doesn't make it legal - find out if the radio you are looking at can be modify if needed, then you can decide if you do or don't wanna make the modification. If you do make the modification, be sure you know what you can legally do and what you can't legally do.